Home > Why Choose the Dogmatic? WHY IS THE DOGMATIC HEADCOLLAR DIFFERENT/UNIQUE? The unique strapping under and at the sides of the chin ensures the Dogmatic stays in place and the nose band does not ride up under or into the eyes which causes distress and discomfort to your dog. 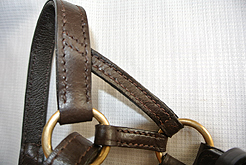 The loop under the chin to which the lead is attached works independently of the other straps and can be moved forward, downwards, back, upwards or sideways as required without causing any other straps to lose their position. 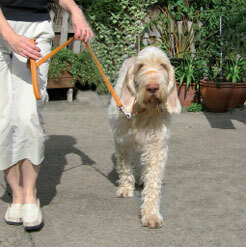 This means the handler can move and alter their dog’s head position leading to total control. We have combined safety with comfort and use top quality materials, fittings workmanship. 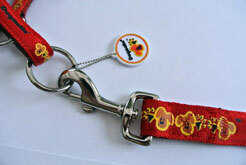 Because your dog deserves the best! If your dog is comfortable, it will pay attention and be more open to training/instruction... without any undue distress.